The information below represents approximations as color, weight and bale sizes vary throughout the year. 1. What's the average bale size? 26" x 13" x 13"
4. 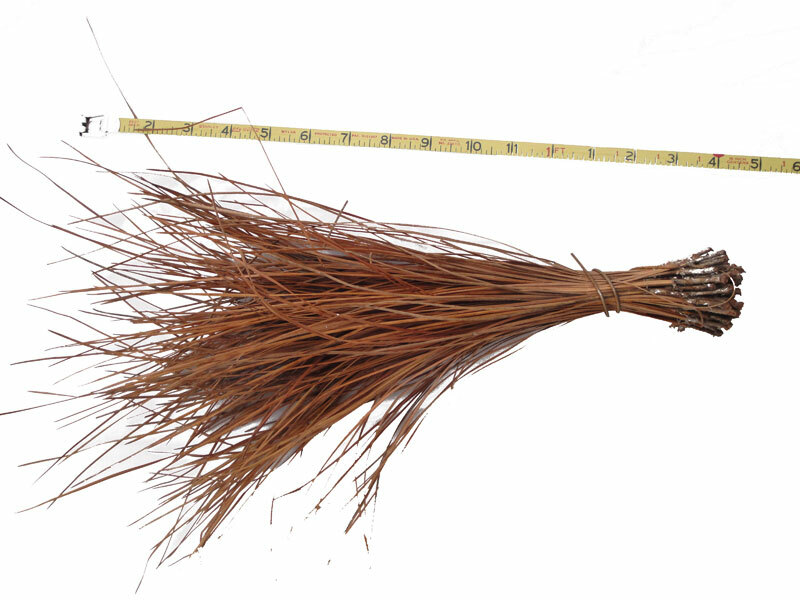 What is the cubic feet of a bale of our Longleaf Pine Straw Mulch? 6. How much pine straw will I need for my landscaping or project? If you have used mulch in the past, a general rule of thumb is one yard of hardwoood mulch will cover approximately 100 sq feet at 2-3 inches deep. Thus, two and half bales of pine straw will cover one yard of mulch. Multiply the length times the width of each of your beds. Then add all your totals up and divide by 100, then multiply by 2.5 and that is the number of bales you will use. In the begining, we suggest you order a few additional bales to ensure ample coverage and margin of error. Visa, MasterCard, American Express, PayPal and Discover are accepted, as well as debit cards which bear the Visa or MasterCard logo. *If you choose to pick-up the pine straw at Maxwell's Hardware, they only accept Visa, Mastercard, Discover, Checks and cash. Payment is required at time of order. 8. Do I need to be at home when you make a delivery? No. Please tell us where you would like the bales of Pine Straw stacked and they will be in that spot when you return home. 9. Can I get an estimate? Yes, we provide Free over the phone estimates to assist you. If you're a repeat customer, we can review your prior orders to tell you how many bales you ordered last time. 10. I'm having pine straw mulch delivered; what if I decide when the truck arrives that I need more? We always carry additional bales on the trailer when making deliveries and if needed at the time of delivery, you need additional bales, we can supply these bales at that time. No need place an additional order and incur an additional delivery charge if you decide to purchase additional bales before the truck leaves your home or business. 11. I just spotted your truck and trailer in my area, can I order now and have pine straw delivered today? Yes, Please call us immediately (484-202-7608) and in most cases we can make your delivery today as we always carry additional bales on the trailer for instances like this. The vast majority are Longleaf Pine Needles which is considered by many to be a Premium Needle. 15. What if I want to switch back to hardwood bark mulch next year, do I need to remove the pine straw? No, you can place the hardwood bark mulch directly on top of the pine straw mulch which will decompose and provident nutrients to your soil. 16. Do you offer an installation service? Yes, we can spread the pine straw for you. Mid-Atlantic Pine Straw Mulch only sells Grade A Longleaf Pine Straw, as Longleaf is the preferred mulch due to its outstanding characteristics. 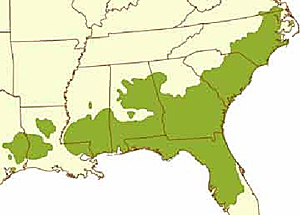 Range of Longleaf Pine Trees in the Southeastern U.S.